Before I started university, I was informed of one major perk: the clubbing, everyone said, is fantastic. Now I love a night out as much as the next person. What I don’t appreciate, however, is my generation’s obsession with a music genre that can only be compared to the flapping sound made by a large sheet of card, with intermittent overtones of ‘car alarm’. Once upon a time, history meant progress. Man invented the wheel. Women got the vote. Justin Bieber has almost made it through puberty. But despite all this, Dubstep (a music genre pioneered, it seems, by a toddler with a ‘My First Keyboard’ that comes complete with audio clips) has dominated the student clubbing scene. My other main qualm with this, aside from that it sounds awful, is that the lyrical element of music becomes increasingly disregarded. And this is a real shame. In an age where poetry has become the reserve of an esoteric bunch of intellectuals and self-important English Literature students, music is a valuable medium. It offers us our last chance, perhaps, for celebrating the euphony of language in a world where language is more devalued than ever. Whilst no one has heard of Dylan Thomas, at least we have Bob Dylan. Keats may be long dead, but our generation has Kanye West. Even The Killers have a shot at writing lyrics which come across as meaningful, albeit nonsensical. 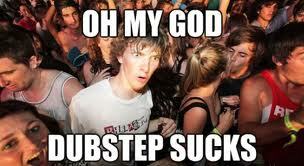 Dubstep, meanwhile, will stick to a vacuous, repetitive strain of lyrics, and drown it out with a continuous thump. ‘Get It While You Can’- Janis Joplin (a ‘carpe diem’ theme which is relatable to everything, not just Joplin’s pursuit of Jim Morrison). ‘Fell in Love With A Girl’- White Stripes (like its namesake, I fell in love with this song from the first time I heard it over a decade ago. Jack White is one of the seminal artists of the twenty-first century, and I am so excited to hear him on the Great Gatsby soundtrack this summer).